Some of the best humidifiers require you to use a filter to clean the water you add to the tank, while others use the filter as a wick of sorts. The filter your humidifier is using may also be using it as a wick. In some cases, it’s a must. It’d be amazing if you could simply clean a filter and use it over and over without having to replace it, but it just doesn’t work that way. 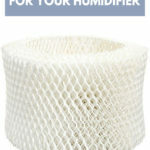 So, it’s necessary for you to find affordable filters to use in your humidifier, if it requires them. The best air humidifier filters are those that work well in your particular humidifier, that work in various humidifiers, and that are affordable. Not all humidifiers require filters, though, so be sure to go over the information in this guide to see whether you would benefit from buying filters. And if you’re unsure of which one you should choose, read through the best air humidifier filters reviews below. Why Do Air Humidifiers Need Filters? Do You Have to Buy the Brand Name Filter Meant for Your Air Humidifier?